(Photo courtesy of the Union Pacific Railroad Museum) This image by American photographer Andrew J. Russell is titled "East and West Shaking Hands at laying of last rail" and shows the celebration of the 1869 completion of the intercontinental railroad. It appears in the new exhibit "The Race to Promontory: The Transcontinental Railroad and the American West" running Feb. 1–May 26, 2019, at the Utah Museum of Fine Arts. 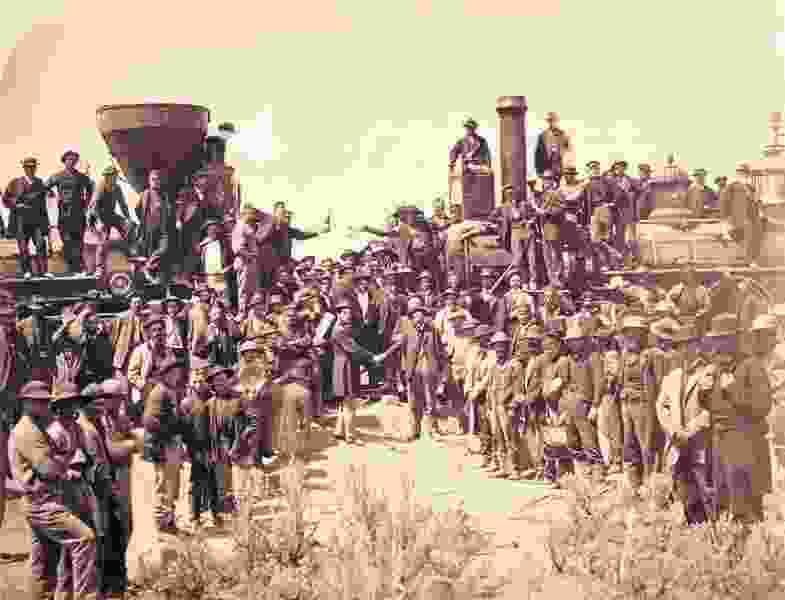 Utah is about to throw a big celebration for the 150th anniversary of the May 10, 1869, completion of the transcontinental railroad. Many realize it was built largely by Chinese immigrants for the Central Pacific and Irish for the Union Pacific. But a third group provided key workers for both railroads: The Church of Jesus Christ of Latter-day Saints. The companies waged a bidding war for their labor in remote mountains and deserts as they tried to lay more miles of track than their competitor to claim more land grants and incentive money. Chris Large | AMC Construction is completed on the transcontinental railroad in the series finale of "Hell On Wheels"
The railroad would speed construction of their Salt Lake Temple, greatly ease immigration by foreign converts, aid missionary work, begin tourism to Utah and provide contact with others — helping the church address distorted reports about it. Historians note that a myth grew that Latter-day Saints had opposed the railroad, fearing it would end the isolation they sought to escape persecution and bring outsiders who did not share their faith or lifestyle. “That was the opposite of the truth,” Ambrose wrote, among others. Young himself said that from the moment his church fled to the West, it immediately started pushing for a railroad and seeking routes for it. “I do not suppose that we traveled but one day from the Missouri River here, but what we looked for a track where the rails could be laid with success for a railroad through this territory to go to the Pacific,” Young said in an 1868 speech. A year earlier, the Mormon pioneer-prophet said in another discourse about the coming railroad, “Hurry up, hasten the work! We want to hear the iron horse puffing through this valley. In 1867, Young predicted the railroad would not overrun church members with outsiders, and said it more likely would “take every apostate and corrupt-hearted man and woman from you” in trains out of the area. After years of petitioning for a transcontinental railroad, Young became one of the original shareholders in the Union Pacific when it formed. In 1863, amid the Civil War, Union Pacific leaders wrote to Young seeking advice about the best route through the territory. He was so eager for the railroad to come that he sent his son, Joseph A. Young, with a group of fellow Latter-day Saints to start surveying possibilities — and personally paid the cost. The group suggested a route up Weber and Echo canyons, a path Union Pacific followed. In 1868, when the Union Pacific was in Wyoming and the Central Pacific was in Nevada, both saw the need to hire Latter-day Saints to start grading far in advance of their rail layers to possibly help them claim more miles. That soon would have Mormon crews working for competing lines doing grade work in sight of and passing each other. Of course, some of those parallel grades were never used — and still sit in the desert — after Congress and the companies reached compromises on where the two railroads finally would meet. 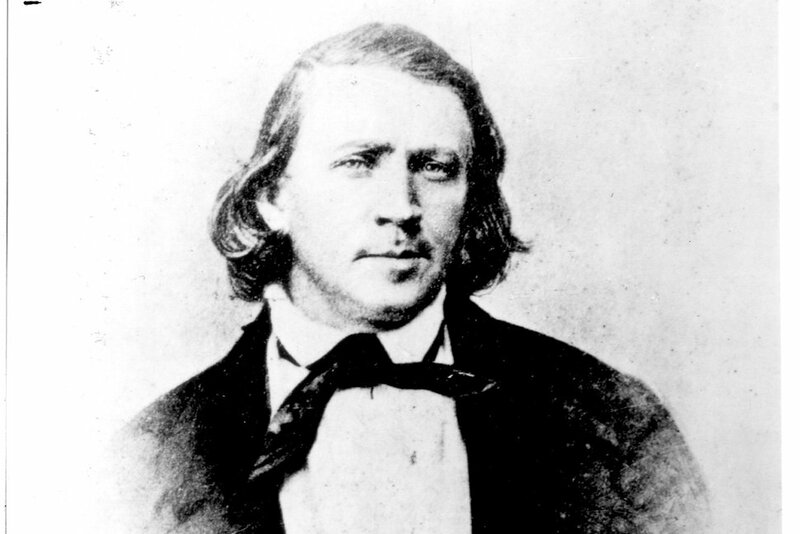 On May 6, 1868, the Union Pacific sent a telegram to Young essentially allowing him to set his own price — and it would supply the tools and materials — if he would accept a contract to install the rail from Echo Canyon to the Great Salt Lake. Young answered yes within an hour. The U.P. eventually promised to pay more than $2 million — but collecting it would lead to a yearslong fight. That year, grasshoppers had destroyed many of the Mormons’ crops, leaving farmers in extra need of jobs to make ends meet. So thousands responded to Young’s call to work on the railroad for Latter-day Saint subcontractors, including firms led by three of his sons. Historian Richard Cowan, a Brigham Young University professor, wrote that local church congregations formed construction companies and became railroad subcontractors. They worked dawn to dusk. “It was acknowledged by all railroad men that nowhere on the line could the grading compare in completeness and finish with the work done by the people of Utah,” historian Hubert Howe Bancroft wrote in 1890. Meanwhile, the Central Pacific also wanted Latter-day Saint workers and hoped church workers could speed up the labor so that the two railroads would meet near the Wyoming border. Leland Stanford, one of the four chiefs of the Pacific line, came to Salt Lake City to see Young — but the Union Pacific had beat him to the punch. Young told him it was all he could do to complete contracts he already had made with the U.P. Stanford kept pleading with Young over the coming months. As the U.P. had trouble delivering supplies and making promised payments, Young finally agreed to a contract with the C.P. initially to build rail between Ogden and the northern tip of the Great Salt Lake (and later farther west toward Nevada). Young had a quarter-interest in the subcontractor for that. Historian Ambrose said a bidding war began as Latter-day Saint subcontractors tried to hire away laborers from one another. Workers faced tough conditions. Milando Pratt, a Mormon farmer near Ogden, worked on the railroad in the desert west of the Great Salt Lake. Pratt wrote that workers battled hordes of grasshoppers and gnats all day, and the stench of millions of dead insects forced them to cover their noses with handkerchiefs. 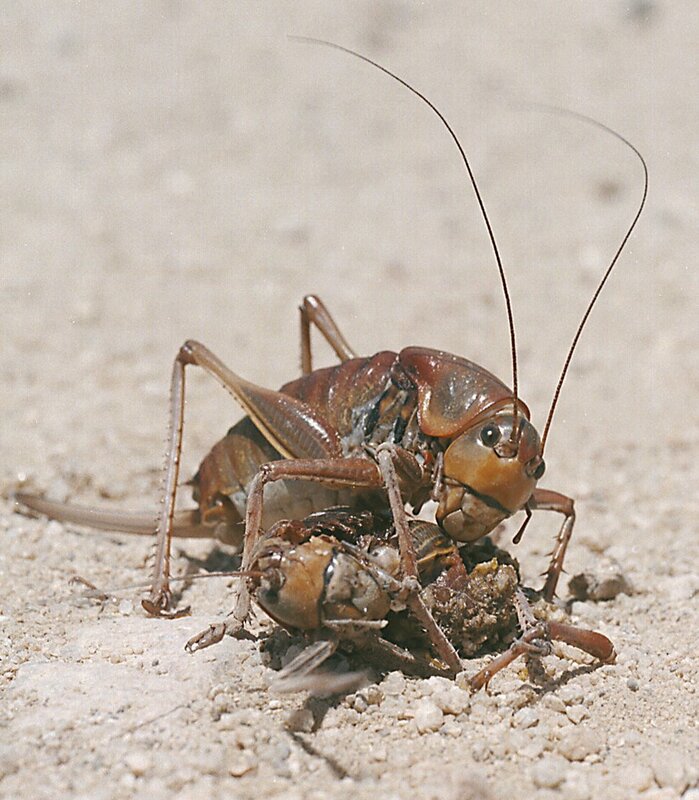 (Debra Reid, AP file photo) In this June 12, 2003, file photo, a Mormon cricket feasts on a dead cricket killed by a car on a rural road north of Reno, Nev. Farmers in the U.S. West face a creepy scourge every eight years or so: Swarms of ravenous insects that can decimate crops and cause slippery, bug-slick car crashes as they march across highways and roads. Crews often worked through the night using sagebrush bonfires for light. In Echo Canyon, crews had to dig several long tunnels. They spent the days drilling holes, packing them with explosives, igniting them and hauling away debris. Young was bedeviled by railroads that would not pay, and ended up using his funds and church money to pay men. He sent a blistering parade of telegrams seeking money, even warning that men would walk away if not paid soon. But he wanted quick completion of the rails even more, so no one left for lack of pay. Young tried hard to persuade both railroads to run through Salt Lake City. But both figured it was cheaper and shorter to go north. Historians say that because of that disappointment — plus the millions of dollars Latter-day Saints were owed — Young chose not to attend the ceremony where the Golden Spike finished the railroad, and instead went on a trip to southern Utah. About 500 to 600 people were at the remote Promontory Summit for that final ceremony. But 7,000 Latter-day Saints crowded into the Tabernacle in downtown Salt Lake City for speeches and celebrations as they awaited telegraphic word of the railroad’s completion. Even bigger celebrations occurred elsewhere. The Liberty Bell was rung in Philadelphia. Cannons fired in San Francisco and Washington, D.C. Chicago had its largest parade of the century. Businesses closed for celebrations in places from New Orleans to Atlanta. The money owed to Young soon turned into a hidden blessing. Because of persistent pushing for that money on Young’s behalf by Bishop John Sharp — who would show up at U.P. offices in Boston daily seeking payment — officials made a partial settlement that instead of cash included vast materials such as rails, spikes and rolling stock. Using that, Mormons broke ground a week after the Golden Spike on what was then called the Utah Central Railroad. Within a year, it connected Ogden and Salt Lake City — and 15,000 people (far more than saw the Golden Spike ceremony) came to festivities to drive its last Iron Spike, with the words “Holiness to the Lord” inscribed on it. Branches of that railroad soon would go all over Utah, including up Little Cottonwood Canyon to quarries providing stone for the Salt Lake Temple, quickening what had been slow construction. That line went all the way to mines at Alta, which might solve some modern-day ski resort traffic congestion if it still remained. Ambrose ended his book on the transcontinental railroad by recounting a talk by apostle John Taylor, who would succeed Brigham Young as church president, at the Tabernacle Golden Spike celebration. It showed how much had changed in the lives of a generation that had traveled most quickly by horse, as had people before them for thousands of years. (Francisco Kjolseth | The Salt Lake Tribune) Mural in Salt Lake City's Union Pacific Deport depicts completion of the transcontinental railroad.